Scottish Canals faces massive repairs from unprecedented volumes of water from increasing rainfall wearing out weirs, locks, bridges and piers. Scotland’s historic canals face major repairs due to a huge influx of extra water from heavy rain that has worn out key parts of the historic network, The Scotsman has learned. Major work on weirs, piers and locks are required as the 200-year-old system is battered by the effects of climate change. The latest overhauls include to a weir on the River Ness where it meets the Caledonian Canal at Loch Dochfour, south of Inverness. The £2 million, two-year project is scheduled to be completed next year. Further south on the canal, Cullochy weir near Loch Oich had to undergo emergency repairs costing £1.2m in 2015. Damage caused by heavy rains and melting snow closed the waterway for more than a month. The Union Canal in Linlithgow had to be drained in January to fix suspected leaks in its walls. There is also urgent work needed on Ardrishaig pier at the east end of the Crinan Canal, estimated to cost between £400,000 and £1.5m. A further £30,000 of repairs are needed on the Forth and Clyde Canal in Grangemouth, where a lock broke on the day the Queen officially opened an adjoining section of the waterway three weeks ago. Working locks are crucial so water can be moved along canals to help avert flooding in areas such as Glasgow. The incidents have forced Scottish Canals, which runs the network, to “recalibrate” its maintenance plans. 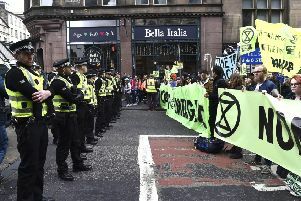 It said the UK Climate Change Risk Assessment 2017 for Scotland highlighted that rainfall went up by 14 per cent between 1960 and 2010, and the increase could more than double to 31 per cent between then and 2050. Mr Dunlop warned that locks and bridges might have to be closed if they posed safety concerns and there was no other option. He acknowledged the Scottish Government – Scottish Canals’ main funder – had no “big money tree” to pay for repairs. He said the public body was trying to generate more income from attractions such as the Falkirk Wheel and the Kelpies to supplement its £11.1m annual grant. It is also buying up canalside land to develop business and other commercial ventures to boost income. These include a former brewery site being redeveloped as housing above Pinkston canal basin, on an arm of the Forth and Clyde Canal just north of Glasgow city centre.